Price Recommended Retail Price £19.99. 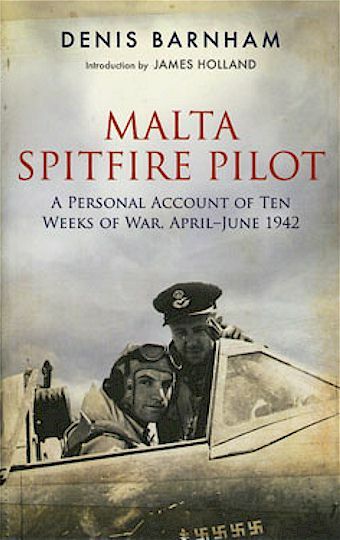 Malta Spitfire Pilot is one of the classic first-hand pilot accounts of World War II. Written by Flt/Lt Denis Barnham, the book covers his ten weeks on Malta at the most dire of times – the siege and the Axis aerial onslaught on the island. Barnham’s memoirs have been around for quite a while, previously published and known as One Man’s Window or Spitfire Ace Over Malta. It is good to see it return in this new issue from Frontline Books. The new title is being justified by a new foreword, historical resume and additional, previously unpublished photos supplied by the author’s family. Throughout the war, Malta was of great strategic importance to the Allies, an was pivotal to their success – or defeat – in North Africa, as it provided a perfect launching pad for aircraft for disrupting Axis naval supply lines in the Meditterranean. The island in turn suffered relentless bombardment by the German and Italian air forces as a result, starved under naval blockade, and was under constant threat of invasion. During the Spring of 1942, the Axis air forces ranged against the island were at their maximum strength: some 500 Luftwaffe and 300 Regia Aeronautica aircraft. While the Spitfires were a match for the Axis aircraft, many of the ones delivered in March and April were destroyed on the ground, and the remainder where hopelessly outnumbered. For instance, for five days in April there was just one Spitfire available to defend the island; for two days there were none. Also, the overwhelming Axis bombardments had substantially eliminated Malta’s naval and aerial offensive capabilities. It was at this moment in history when Barnham arrived in Malta as a relatively inexperienced pilot. The story starts with his trip onboard the American aircraft carrier USS Wasp as part of Operation Calendar – the resupply of Spitfires to the besieged island by air on 20th April 1942. Already on the following day, Barnham found himself flying in combat as part of No. 601 Squadron stationed on the island. He was lucky to survive his first encounters with the enemy. Clearly an exceptional pilot, he grew into a battle-hardened Spitfire ace over the grueling tour of two hundred operational hours between 13 April and 21 June 1942. The main part of Barnham’s memoir was written during his time on the island, as he and his fellow pilots battled against terrible odds and under constant pressure. Many wartime memoirs written during or directly after the war give better account on how it felt to be there than today’s fact-laden books, which all too often read like they were written by historians. This one, originally published in 1956, falls firmly into the former category, distinguishing itself not only the exceptional quality of the writing but the sensitivity of the writer to the dire circumstances which faced the Malta defenders and population. The maturity of his account is even more noteworthy knowing that he was only 22 years old – a former art student. Some of his outstanding drawings illustrate the book. This book is a great read. It is being fundamentally honest about the fear that wasn’t allowed to show, courage and horror, and the self-doubt. It deserves – once again – to be a popular choice, and should be read by anyone interested in the air war. I was searching the net to see if any reprints of Mr. Barnhams fine drawings were available, only to find this link to his book. I was rereading one of the fine accounts of the entire wartime story of Malta. I will soon be ordering up his book and I am happy to now know that he completely survived the war and assume lived a happy life with his bride, Diana. I came across your comment when I was looking for Dennis Barnham pins for my Pinterest board. Dennis is the grandfather of my son in law. He is sadly dead now but his widow Diana is still alive but not in good health. I met her at my daughter’s wedding and thought she was a very charming lady.